Skin cancer is one of the leading and also preventable types of cancer. Interestingly, it is the most common form of cancer in the United States. 40-50% of Americans who live past 65 years old will develop skin cancer at least once in their lifetime. When found early and treated promptly, skin cancer is nearly 100 percent curable. Our knowledge of skin cancers is rising rapidly, and research has led to better modalities of treating and diagnosing this disease. Dr. Zemmel performs surgery on skin cancers all over the body and face, and he is most up to date with the latest diagnosis, treatment, and research in the area. There are two main types of skin cancer: Melanoma and Non-melanoma skin cancer. Although most individuals have heard about melanoma, it is actually the non-melanoma skin cancers that are by far more common. Non-melanoma skin cancers include basal cell carcinoma and squamous cell carcinoma. Interestingly, basal cell carcinoma accounts for more than 90% of all newly diagnosed skin cancers. Basal cell skin cancer is very slowly growing and only locally spreads; rarely does it spread to other parts of the body. Squamous cell skin cancer also rarely spreads, but it does so slightly more often. Even though both rarely spread, it is still important to find and treat them early because they can invade and destroy surrounding tissue. Melanoma is not as frequent as these other two types of skin cancer, but is a more aggressive and dangerous form. It is known to frequently spread to the local lymph nodes and also distantly in the body. Skin cancer develops over time when a healthy cell that makes up the body’s tissue grows and divides in an abnormal and too frequent fashion. Too much tissue is then produced and the skin cancer begins to grow. This abnormal development is directly caused by exposure to certain light radiation from the sun and tanning booths (UV-ultraviolet rays). Although anyone can get skin cancer, certain individuals are more prone to it. Those at highest risk include: fair skin, freckles, red or blonde hair, blue eyes, weakened immune system, and high exposure to sunlight. Although these risk factors are for all skin cancers, melanoma has additional risk factors: abnormal moles, more than 50 moles, and a family history of melanoma. The risk of developing skin cancer is also affected by the place when a person lives. Those that live with a stronger sun exposure, such as Florida, are more at risk than those who live in Maine. Here in Richmond, there is still a strong UV presence, and skin cancer is quite frequent. Dr. Zemmel and our team at Richmond Aesthetic Surgery deal with skin cancer on a day-to-day basis. The signs and symptoms of melanoma are slightly different: it is a change in the size, shape, color, or feel of an existing mole. Unlike other forms of diseases and cancers, skin cancers do not cause pain or very noticeable symptoms. Unfortunately, the most common warning sign is only a change in the skin: a growth or sore that does not heal. A new bump, lump, color change, scale, crust, or subtle skin change may be the only sign that a skin cancer is beginning. Both basal cell and squamous cell skin cancers are found on areas of the body that are frequently exposed to the sun–the head, face, neck, hands, and arms. However, these skin cancers can form anywhere on the body. If you have any new lesions or changes in your skin, then it is important to bring this up with Dr. Zemmel during your visit to Richmond Aesthetic Surgery. Color –the color is uneven. Different shades of brown, black, and tan may be present. 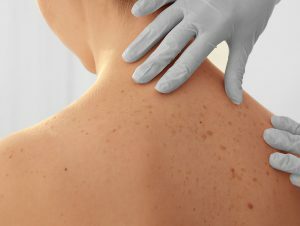 If you find this is the case of a mole you have on your body, then it is important for your doctor to be aware of this. Close detection and early treatment yields a near 100% cure rate. Please check yourself regularly for new color changes, growths, changes in the skin. When this does happen, then make an appointment with the Dr. Zemmel for a full evaluation. When an area of skin does not look or behave normally, Dr. Zemmel will remove part or all of the growth. This is called a biopsy. To see what this biopsy shows, Dr. Zemmel will send the tissue to a pathologist to look at the skin under a microscope. Only by looking at the biopsy under the microscope can he see if it is skin cancer or something non-cancerous. If the biopsy is indeed cancer, then your doctor may need to check your lymph nodes or use special x-rays to make sure the cancer has not spread anywhere else. Dr. Zemmel and his team at Richmond Aesthetic Surgery are abreast of the newest and most up to date treatments and surgical techniques to treat skin cancer. Their goal is to completely destroy or remove the cancer with the smallest and most inconspicuous scar possible. To choose the best treatment plan for his patients, our board-certified plastic surgeon considers the location of the skin cancer, the risk of scarring, your age, general health, smoking status and medical history. Treatment for skin cancer usually involves some type of surgery. Many skin cancers can be cut out from the skin quickly and easily. In fact, the cancer is sometimes completely removed by your surgeon at the time of the biopsy and no further treatment is needed. Surgical removal of the skin cancer requires taking a smaller amount of additional skin around the lesion to make sure that all cancer cells are removed. It may take ¼ or more of additional skin around the whole lesion circle to eradicate the cancer. Sometimes that means there is a decent sized skin loss after the cancer is removed. Your surgeon may have to make additional incisions to move local, new skin into that area. Rarely, the area is too large to close by nearby skin, and a skin graft may be needed. Dr. Zemmel is trained in camouflaging and making the best local treatment options to minimize visible scarring, such as with laser scar removal. This is particularly true when cancer involves the most cosmetic areas of the face. He uses cutting edge surgical techniques to replace the skin lost during removal of the cancer. Occasionally, depending on local spreading of the cancer and whether lymph nodes are involved in the cancer or not, then additional therapies may be needed. Your surgeon may need to take one or two lymph nodes from a nearby collection of lymph nodes (armpit, neck, groin) to assure there is no spread of the cancer (sentinel lymph node biopsy). This is becoming more and more the standard of care for melanoma. Our doctor may refer you to another surgeon for a lymph node biopsy. He may also refer you to a radiation oncologist if radiation therapy is needed for treatment or to an oncologist if chemotherapy is needed. Dr. Zemmel and his team at Richmond Aesthetic Surgery will be there to help you through the road ahead with skin cancer. He will answer all your important questions, help you to make an informed decision, and provide any support you may need. Luckily, skin cancer is cured in 85-95% of all cases. However, any diagnosis of cancer can be frightening, and Dr. Zemmel will assist you with whatever you need in your journey to being cured.